I love Thai food. The flavours are always so fresh and vegetables are often the star. Tom Yum is one of the cooked dishes I will eat if I am going out to dinner with friends and there are no raw options. It’s still all vegetables in a light spicy broth. But making a raw version of Tom Yum or Tom Kha is so easy to do at home. The main difference between the two is just the coconut which is used in Tom Kha. So if you are looking for a fat-free version just leave it out and perhaps add extra tomato for a Tom Yum version. Choose from a variety of fresh raw shredded or spiralised vegetables like cucumber or zucchini noodles, carrot, mung bean sprouts, snow pea greens, cabbage, tomatoes, turnips or anything else that you have. 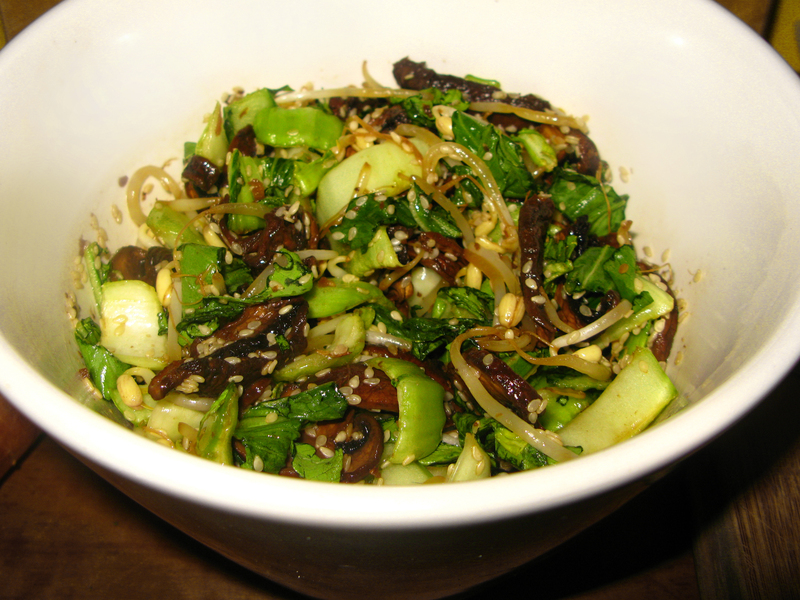 In the picture above I used snow pea greens and cucumber sliced into wide noodles with a vegetable peeler and a few slivers of avocado. Place the lemongrass, lime leaf, ginger, galangal, celery, coconut and water into a blender and process until well mixed. Strain through a nutmilk bag or a fine sieve. Pour the liquid back into the blender and add the remaining ingredients. Blend well. You may like to gently warm the stock to a low temperature before pouring over the vegetables, but it does just fine as a cold soup as well. Place your vegetables of choice into a bowl and pour the stock over the top. As a way of using up the pulp left over from creating the stock, I tried making these little dumplings. Simply form hand rolled balls from the pulp. They will crumble if you sit them in the soup for too long, but you could place them on top of the vegetable of your tom kha or eat them right away. They would probably do well in the dehydrator also. This was part of my delicious lunch today. I keep a packet of nori sheets in the cupboard at work so I can stuff them with whatever greens and veges I bring with me or grab from the supermarket. Sprouts make a great stuffing for nori rolls as they are nice and compact allowing you to roll it up nicely. Almost any vegetable works in a nori roll, zucchini or cucumber, grated carrot, tomatoes, olives, herbs, the combinations are endless. Asparagus is right in season now and it’s the perfect shape for a nori roll. Lay your nori sheet flat on a board or a bamboo sushi mat and cover with the lettuce leaves first to prevent the nori getting soggy. Leave about 2cm clear on one side. Then add your remaining fillings lengthways along the centre of the lettuce. Squeeze a few drops of lemon juice on the fillings and on the clear edge to help it all stick together once you have rolled it up. You could also use water for this. Now using your sushi mat or just your hands roll up from the opposite side the the clear edge. Press the roll tightly in on itself as you roll it up. Cut in thirds or in half and use a little tamari & lemon juice as a dipping sauce if you wish. It also tastes great without it. Red cabbage is one of my favourite leaves to use as a wrap. It looks amazing, it’s crunchy and you can fit a lot into one leaf. It’s really one of the things we raw foodies use as a bread substitute. The ingredients below are pretty much what I had in the fridge today. You could just as easily use things like cucumbers, tomatoes, sprouts or leftover salad. Whatever takes your fancy. Finely grate the carrot. If you have a fine grater like one usually used for parmesean you will get more juicy flavour from the carrot. Mash in the avocado, lemon juice and finely chopped chives. Add a little himalayan or sea salt if you wish. Take a red cabbage leaf and fill with a few green leaves of your choice and top with some of the carrot avocado mixture. Top with some dulse (karengo) and a few chopped chives. A few people have asked me to post the types of things that I take for lunch. I am fortunate enough to work in an office with a modest kitchen, so I can quite easily assemble salads and things with produce I keep in the work fridge or that I grab from the supermarket over the road. I’m not really into eating a lot of fats anymore, I’m close to 80/10/10 but I’m not strict about it, I just try to keep it low-fat with lots of fruits and vegetables. So with these wraps I try to keep the amounts of flax seeds quite low and bulk them up with celery and psyllium instead. The amounts are very approximate so use what you have on hand and they’ll probably still turn out fine. I’ll write it down properly with the next batch. Blend everything in a high speed blender until smooth. You may want to add the water gradually. The psyllium and flax will absorb the water and make a thick gel like mixture, so you can always add more water if you think it is too thick. Spread the mixture out into circles about 3-4mm thick on dehydrator mats. Make sure not to have any spots that are too thin. Dehydrate for about 4 hours. Check as you go that they are not getting too dry. They should still be pliable. Flip them over and dehydrate another 2-4 hours. Store in a ziplock bag or container. Tip: If you over dehydrate and end up with large thin crackers instead, you can take a spray bottle filled with water and finely mist them. Lay them between damp paper or tea towels and they will become bendy again. You can pretty much use anything you would normally have in a salad sandwich. For these I had lettuce, cucumber, tomato and grated carrot with a squeeze of lemon juice and a wee bit of sea salt. A small amount of avocado would go down well in the mix too. I find that grated veges are more juicy so I don’t have the need for a dressing or dip which keeps things nice and simple. It’s mid-winter here in New Zealand and the organic supermarket is full of celeriac and fennel, two vegetables that go well together in a kind of rustic French way. Celeriac is one of those underrated but highly versatile vegetables that often gets shunned for it’s rather unelegant apperance. It’s not the root of celery as it’s name suggests but kind of like a cousin, similar in flavour but a little more nutty. With the fennel, lemon and celeriac, this whole dish is very high in vitamin C. Mother Nature sure knows how to look after us by providing produce that’s high in flu-fighting properties during the winter. It’s also pretty high in magnesium, phosphorus and vitamin K. Make sure to use the zest of the lemon as well as the juice to give the risotto that wonderfully fragrant flavour. Yum. Trim off the outer layer of the celeriac root to remove all the dirt filled crevices, dice into cubes and pulse in a high speed blender or food processor with the lemon juice until fine. It should be about the size of rice or a little smaller in order to release more of the flavoursome juices. Adding the lemon juice at this point prevents the celeriac from discolouring as it oxidises. Set the celeriac aside and process the sunflower seeds, miso paste and water until fairly smooth but still with a little texture. Combine the sunflower mixture with the celeriac and the remaining ingredients. Season with extra black pepper, sea salt and a little cold pressed olive oil if desired. Serve in a bowl garnished with chopped celery leaves and lemon zest, scoop up with flax crackers or even wrap in romaine leaves with some fresh alfalfa sprouts and your favourite greens. This is so like a cooked stirfry you could easily fool your cooked foodie friends. The mushrooms you need to do in advance, but you could get away with not dehydrating the greens if you let the dish sit and marinade for a half hour or so, or just eat them crunchy. Wash and slice the mushrooms about 5mm thick. Throw all the ingredients into a large bowl and mix with your hands until the mushrooms are well coated. Place onto mesh dehydrator trays and dehydrate for about 6 hours. 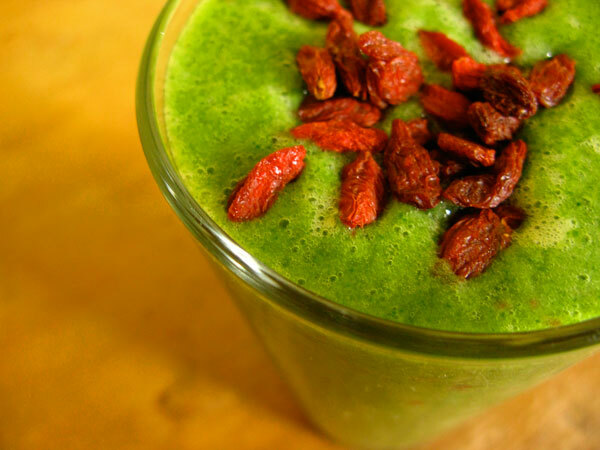 Place in a blender and blend until well combined. Strain to remove any large chunks of ginger. Combine all everything in a bowl and toss to combine. 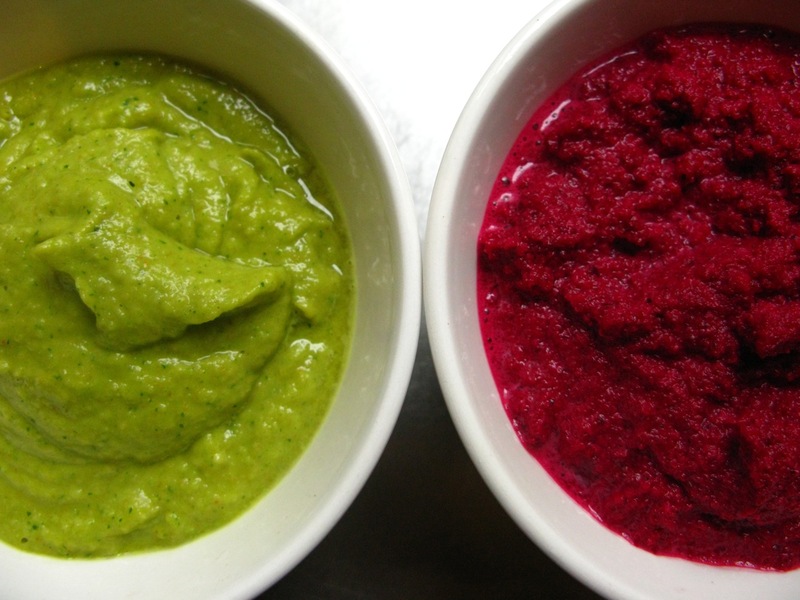 These are a couple of Turkish inspired dips that you can use with almost anything. Perfect with celery sticks, cucumber slices or flax crackers, delicious with salad stuffed into a large leaf of romaine and great on their own as a soup if you add a little extra water. The flavour of this dip reminds me of Mucver (pronounced MOOSH-vair), the zucchini fritters often served in a mixed vegetarian kebab or as an entree in Turkish restaurants. Chop up the zucchini, avocado and garlic into smaller pieces. Add with the remaining ingredients to your food processor or high speed blender and blend until smooth. You can add a little water if the dip seems too thick. This was once a favourite of mine in vege kebabs. The traditional version sometimes has yoghurt which I have substituted here with brazil nuts although you could easily use cashews or macadamias or omit them all together if you are looking for a nut free version. Chop up the beetroot and garlic into smaller pieces. Both of these dips should keep for a week in an airtight container in the fridge.